Even long-lasting tests made upon developing any software usually do not assure 100 % optimization. Many problems, imperfections and also impulses to their solutions and improvements are then only brought thanks cooperation with final users. The result of these steps are occasional issues of updates, patches and service packs. Updates - usually solves a newly found problem or brings some new function. It can include solutions for more problems. Hotfixes and patches - solves some found problem. Most frequent problems concern security and possible danger of instability and malfunction of the system. Service packs - contain updates, patches, hotfixes and drivers collected during a longer time period and so do not come out as often as needed. If they are issued, they contain more updates and patches for a longer time period. The size of such pack for Windows usually range about 100MB. Installation of these packs are required before installing some recent applications. Many revisions are issued under numbers qxxxxxx - Q represents relation to an article of knowledge base and xxxxxx represent the number of the article. However, most administrators need to install the patches and updates independently and much sooner. The Windows update function becomes the easiest way of updating - by help of the Windows update icon on the Start menu or the wupdmgr command. After choosing one of these possibilities you will be linked to windowsupdate.microsoft.com. You will be displayed an Internet page with downloads of updates, service packs, patches, drivers and some new applications belonging to the system. After connecting and clicking the "Scan for Updates" button, information about installed updates and programs concerning your computer and OS will be sent from your computer. This information will be compared to the list of available data on the server. After this, items that you can install on your computer will be displayed. Besides revisions, there are also recent products relating to your operating system, e. g. new version of the Internet Explorer application, DirectX support, new Multimedia player. Everything depends on the type of the operating system you have and whether you have installed some of the applications or updates. Each item contains a brief description, sometimes with a link to a detailed problem solution. Some individual components must be installed separately and after restarting you can go on downloading other updates, e. g. Internet Explorer - you may not install other applications or updates together with this application. Not all issued updates are required by your computer. Some can be just small improvements or revisions to devices and applications that you even do not have on your computer. Tools for checking the system security. They can search available updates, similarly to the Windows update function. They cannot download updates and programs. In combination with Internet connection they also provide information about installed and available hotfixes and service packs not only for your operating system, but also for some other applications and products (Internet Information Server, Office, SQL Server, ..). Tools designed for OS MS Windows 2000 and Windows XP (other requirements you will find in the tool´s help). 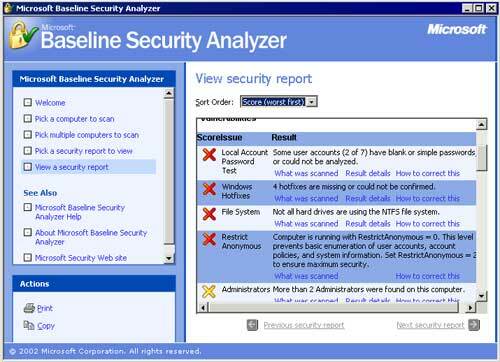 Program for scanning PC and analyzing possible security risks and problems. Installation of the program from the Internet and launching of the graphical environment through the icon on the desktop. It checks the basic security settings, e. g. . 1. Whether there is the NTFS system being used on all discs, 2. Number of administrators, 3. Using of empty or simple passwords in user accounts, 4. Disabling Guest user, 5. Limiting anonymous connections, 6. Autologon and some other settings relating to security. Launching from the command line and writing out the results in textual form. It is easier, but does not include so many functions as MBSA. Using XML data version = 1.0.1.308 Last modified on 6/26/2002. c. Qfecheck - a utility for the command line. 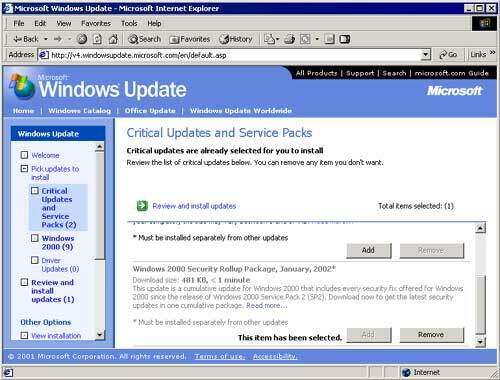 It displays installed service packs and updates (Windows XP). Current Service Pack Level: No Service Pack is installed. Service packs (SP) can be implemented into installation directories (Article: Integration of Service pack into installation files). After you once install an SP and you later install another components you do not have to install the SP again (in 99% of cases for Windows 2000/XP). SP can only be installed by a user with administrator authorization. For Windows XP you can set up automatic download of updates.